Lot:6001 Lincoln, Alabama. 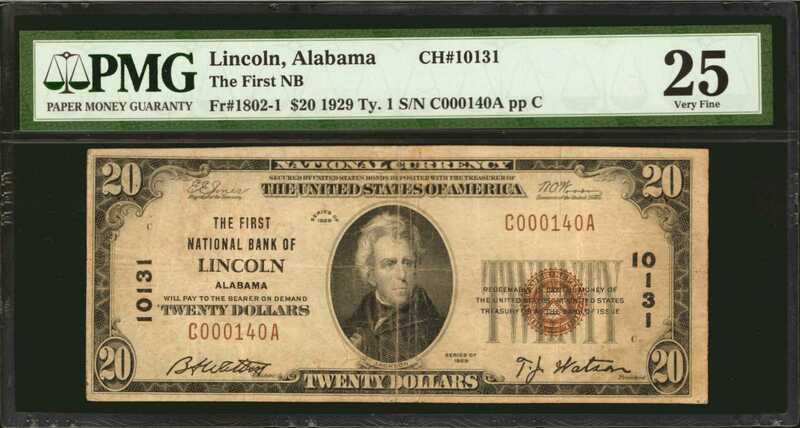 $20 1929 Ty 1. Fr. 1802-1. The First NB. Charter #10131. PMG Very Fine 25. Lincoln, Alabama. $20 1929 Ty 1. Fr. 1802-1. The First NB. Charter #10131. PMG Very Fine 25.It has been over 15 year years since a small size example has been offered on this rare Talladega County bank. This newly discovered note makes the census total four, with this example probably the same grade or a touch finer than the others. It is seen with honest circulation and completely free of any problems.